There’s an impressive outcrop of rocks (psammite and semi-pelite, looking rather like limestone) near the waterfalls in the River Affric. Some kindly soul had balanced these pebbles on a boulder on their way past previously. Some kindly passer-by had arranged this small collection of local stone for my amusement. 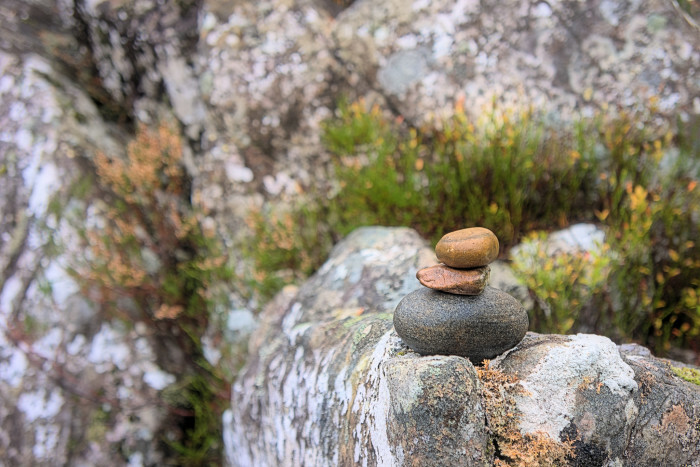 This entry was posted in closeup, intimate-landscape, Landscape, landscape, photos, Scotland and tagged balancing, bokeh, closeup, depth-of-field, DoF, geology, Glen Affric, hdr, highlands, pebbles, photography, rocks, Scotland, stones.